(aka) National Council of the United States Society of St. Vincent de Paul Inc.
Our national network of volunteer Vincentians are inspired by Gospel values, grow in holiness by providing emergency assistance and disaster relief to the poor, homeless, orphaned and sick. We visit them in their homes, prisons and hospitals. Alicia is grateful to get out of a homeless shelter with her 7-year-old and triplet toddlers. Grateful to get help from a local charity that bought her a minivan, lined her up with job interviews and has pledged its help for a year. 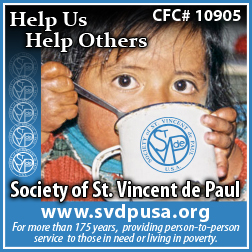 St. Vincent de Paul Society is a nonprofit Catholic lay organization that coordinates help for the poor through Catholic parishes, though its aid is not limited to Catholics. "We get probably 500 calls a week (for help)?, a local spokesperson for the Society said. "We are helping the homeless, assisting with rent and utilities, and feeding and clothing the poor. I go home at night thinking, how can we do more to meet the increasing needs?? The Society of St. Vincent de Paul has pledged to follow Alicia through a year, as long as she does her part in trying to find work and being sincere about helping her family climb out of poverty. The St. Vincent de Paul Society lined Alicia up with a job interview at a Wal-Mart and a day care where her children could attend at a discounted rate. "I can't stress enough that I am so grateful," she said. ?People I don't even know are helping us-I don't even know what to say. Thank you doesn't seem like its enough.? Please pledge your support to help the poor in your community-enter 10905 on your CFC pledge card.